I will tell you right now — without any doubt or hesitation — that the first person I ever met at the little Owl Creek Country Club in Anchorage, KY. is one of the finest people I have ever gotten to know in my entire life. And, to be sure, that’s a funny use of term — bar. Truly. Because it was in the bar at Owl Creek Country Club where I got the first chance to meet Horace Ray Thompson. It was in the bar at Owl Creek Country Club that we shared many a lunch together. At least once a week, if I was in town. It was in the bar at Owl Creek Country Club that we shared many stories; many thoughts; many opinions; many things called life. Ray was a lot wiser and a ton cheaper than going to a therapist. Plus, I trusted Ray. He had a master’s degree in life. And, it was in the bar at Owl Creek Country Club that we shared our love for Thoroughbred racing, breeding and stories. He loved talking about handicapping, and betting. Most of all, though, he loved watching the horses run. To be honest, I never knew that his first name was Horace. Not until last week when I called him at a rehabilitation clinic in South Louisville, where he was resting after being treated for pneumonia, and some other serious lung health issues. But that was about the only thing that I had not grown to know — or admire — about the man. You see, Horace Ray Thompson was the bartender at Owl Creek Country Club. Held the same job for damn near 45 of the 90-plus years he got to spend on God’s Green Earth. And, he was just as comfortable mixing a conversation as he was a feisty Bloody Mary. And, he made a damn good Blood Mary, mind you. Didn’t mind what the subject was. Didn’t matter what the mood. Didn’t matter what the time allotment. Ray could spin a story; offer advice; fix a cocktail and your problem; and never miss the next race on the TV. And, one half of his life, Horace Ray Thompson spent at Owl Creek. He was there when the City Limits of Louisville was still a long way from the tiny, little suburb stuck in the woods and weeds of Anchorage. He was right there when the city folk used to catch the train and come out to the country for summer vacation and golf at Owl Creek. He was right there when the Club used to host annual Kentucky Derby parties that were the absolute rage. Dancing and drinking went long into the night after the races had subsided, and Ray would drive many of the partygoers home. He was right there at the Club when the police busted in one Derby Day and confiscated the book-making money and betting slips. Truth be known, Ray pocketed a little of the cash before the hard-boots were able to discover and take possession of all the betting action. He doubled as a bookie, from time to time. He was right there when the forefathers of the Club had the chance to purchase enough land surrounding the golf course that would have enabled them to convert the historic 9-hole into a full-scare, championship, 18-hole venue. He encouraged them to do it. They didn’t listen to either Ray or reason. He was right there when the club flourished. And, he was right there through the thick and thins. He was there when the club changed managers about as often as the golf pro and green superintendent changed the hole location on all nine of the beautiful holes. He was there. Always, right there. And, he was there for me, too. A couple of years ago, I went through a pretty serious health issue with my own set of stubborn, quirky, and flaky lungs. I struggled to just put on my clothes in the morning. I would get out of breath brushing my teeth. I found that I couldn’t do what I used to do. And, I found myself mired in a spiraling, deep depression that left my world both black and barren. Really didn’t know where to turn. Or how to escape. Or what to do. Until, I stumbled into Owl Creek one cold, wintery day. Until, I stumbled — literally — right into Ray. Ray was a solid guy for a man approaching 90 years old. In his younger days, he could hold his own in both a drinking game and a boxer’s match. Got thrown out of a bar room or two. And, as a bouncer — at some of the old, downtown night clubs — he was able to throw a few out, as well. Ray grunted from the collision, but that was about it. “Hey, Mr. Thatcher,” he announced to no one else. Ray never did know my last name, mind you. The membership was under my wife’s last name of “Thacker.” And, Ray did his best imitation of that name. But it didn’t matter. Not to me. I didn’t have the heart to ever correct him. “You having lunch with me today,” Ray asked. When I said I was, he grinned widely. He decorated the bar with a lunch mat, napkin and utensils. And, he pulled out his tip sheet — which he purchased every, single day at Evergreen Liquors in Middletown. “Got any winners today,” Ray asked again. Ray never missed asking that question. Never. A few years back, I got a tip on a horse that was running at Keeneland. 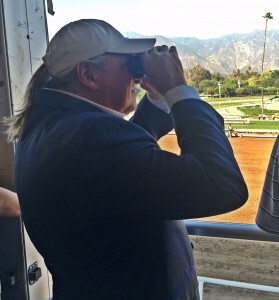 I passed along my insider info to Ray, and the horse went off at odds of 100-to-1. And, he won. By over 10 lengths. Ray and I both cashed handsomely that day. I told Ray that I didn’t even handicap. And, Ray — the master “people person” that he was — could tell there was something wrong in just the tone of my voice. For the next two or three hours — who is counting, really — the two of us sat at that Owl Creek bar and chatted. I told Ray about my health issues, and how I felt poorly. I told Ray that I didn’t know what “good” I was any more. I told Ray that I didn’t know what I was going to do, professionally. And I told Ray that I was sure whatever it was that I ultimately decided to do, that I wouldn’t be very good at it. Ray pushed a few Coke’s my way and served me lunch. We watched a few races. Most of all, he just let me talk. And, he listened. Just listened. “Mr. Thatcher, I don’t know much. All I have ever been is a bar keeper. All my life, I have spent right here at Owl Creek. I haven’t amounted to much. But I do know people. And, you are a keeper,” he said. Before I could move an inch, I had to promise. And, I did. Every week that I could, I returned to that bar up at ole’ Owl Creek. Didn’t go for the food. Or the drink. Went for the conversation. Went to see Ray. Went to watch a few races and talk with my friend. We talked about Ray’s upbringing in rural Tennessee. We talked about the old home place where he grew up, where there was no running water or electricity. We talked about how Ray journeyed to Louisville, and got his first job. We talked about his son, Ray Jr., who retired a few years ago after a long tour of duty at the Ford plant. He loved Ray Jr.
We talked about his family reunions, and his many brothers and sisters. We talked about his one brother, who started a flower shop in downtown Nashville many decades ago. The flower business did OK. But his brother sold the building he owned for millions. We talked about his love for Owl Creek. And, we talked about why he got up four days a week and would fight the traffic on the Gene Snyder to get to work. And, we talked about how long he might work or if he would ever retire. Most of all, we talked. To each other. With each other. About a year ago, Owl Creek announced that it was going to do a major renovation of the clubhouse. The Board of Directors decided that the club needed a new “Sports Bar,” equipped with TVs and other amenities. I never saw the “Big Guy” any more proud. It was almost as much fun as when he won the race with the 100-to-1 longshot. Almost. His time had finally come. I never got the chance to see Ray again. I can’t imagine Owl Creek without my friend. He was a fixture. A legend. The bar keeper that you came to love. To be honest, I can’t imagine life without Horace Ray Thompson, either. He was my fix. He was my legend. He was my keeper that I came to love. And, I will miss him so.